Snowflakes in a maze may be connected. Dry erase markers can be used on cover to solve the maze, then be erased. A solution is provided. 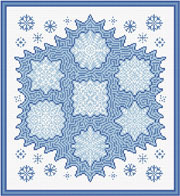 Snowflake trim enhances the design. Colors may be changed.